The Missouri Botanical Garden’s iconic geodesic dome greenhouse, the Climatron®, encloses what might be the most surprising half-acre of land in the Midwest. From the moment that you enter, no matter the season, you are immersed in a thriving tropical rain forest environment. You feel the heat and humidity; you hear the sounds of gurgling water and cascading waterfalls. A lush, green landscape of exotic plants surrounds you. Some plants and flowers perch on inhospitable-looking rocks, while others cling to trees that appear to brush the top of the 70-foot-high dome. There is a river aquarium with strange fish, and a bridge overlooking the unusual vegetation. Everywhere, there are bright flowers. The Climatron needs no interior support columns, providing plants with more space and light than a conventional conservatory. 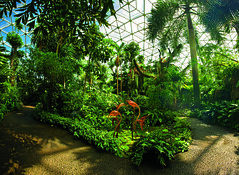 The dome houses more than 2,800 individual plants, including 1,400 tropical species. The double coconut palm (Lodoicea maldivica) has the largest seeds in the entire plant kingdom, weighing up to 50 pounds each. This particular tree was planted inside the Climatron in 1982. Nearby is the traveler’s palm (Ravenela madagascariensis) from Madagascar, so named because thirsty travelers could find stores of water in many parts of the plant, from its fan-like leaf folds to its flower bracts to inside its hollow leaf bases, which can hold up to one quart of water each. Although not a true palm, the traveler’s palm is nonetheless striking. A true palm on display is the old man palm (Coccothrinax criinita), which earns its moniker because its fibrous trunk looks like the long, straggly beard of an old man. Further down the path, visitors will encounter a bed of water lettuce (Pistia stratiotes)with its spongy, air-filled leaves floating on a small pond alongside glass sculptures created by famed artist Dale Chihuly. Across the way is a sampling of cycads, the primitive ancestors of pines nicknamed “dinosaur plants” because they flourished alongside the dinosaurs millions of years ago. Of special interest to locals is the Dioon edule from Mexico, which dates back to the 1904 World’s Fair held in St. Louis. Plants growing on top of plants, called epiphytes, form their own forest. 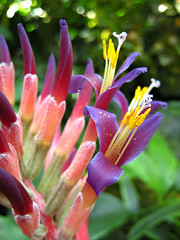 View orchids, bromeliads and ferns, as well as an epiphytic cacti and a rare epiphytic cycad. Ever wonder where your favorite sweet treat comes from? Look for a chocolate tree (Theobroma cacao) with football-shaped fruits growing along the trunk. Inside are beans that can be scooped out, fermented, dried, roasted and refined. Also growing in this “Plantation Trail” area are other plants that bring economic benefits, such as rice, papaya, pineapple and bananas. One of the strangest looking trees on display is the screw pine (Pandanus),which looks like it is standing on twisted stilts. It is actually a flowering plant whose leaves are used in thatch, baskets, hats and mats.